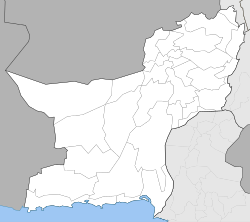 Map of Pakistan showing Mehrgarh in relation to the cities of Quetta, Kalat, and Sibi and the Kachi Plain of Balochistan. 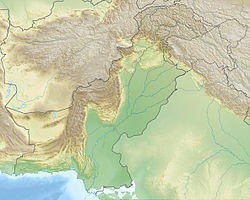 Mehrgarh (Balochi: Mehrgaŕh; Pashto: مهرګړ‎; Urdu: مہرگڑھ‎;), sometimes anglicized as Mehergarh or Mehrgar, is a Neolithic (7000 BCE to c. 2500/2000 BCE) site located near the Bolan Pass on the Kacchi Plain of Balochistan, Pakistan, to the west of the Indus River valley. Mehrgarh is one of the earliest sites with evidence of farming and herding in South Asia. [note 1] Mehrgarh was influenced by the Near Eastern Neolithic, with similarities between "domesticated wheat varieties, early phases of farming, pottery, other archaeological artefacts, some domesticated plants and herd animals. "[note 2] According to Parpola, the culture migrated into the Indus Valley and became the Indus Valley Civilisation. Jean-Francois Jarrige argues for an independent origin of Mehrgarh. Jarrige notes "the assumption that farming economy was introduced full-fledged from Near-East to South Asia,"[note 2] and the similarities between Neolithic sites from eastern Mesopotamia and the western Indus valley, which are evidence of a "cultural continuum" between those sites. But given the originality of Mehrgarh, Jarrige concludes that Mehrgarh has an earlier local background," and is not a "'backwater' of the Neolithic culture of the Near East." Mehrgarh painted pottery. 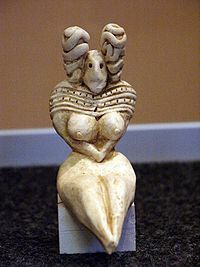 3000-2500 BC. 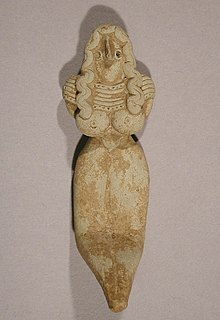 Seated Mother Goddess ,3000–2500 BC. Mehrgarh. 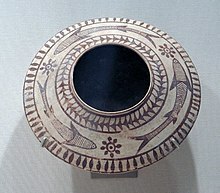 ^ Excavations at Bhirrana, Haryana, in India between 2006 and 2009, by archaeologist K. N. Dikshit, provided six artefacts, including "relatively advanced pottery," so-called Hakra ware, which were dated at a time bracket between 7380 and 6201 BCE. These dates compete with Mehrgarh for being the oldest site for cultural remains in the area. ^ Genetic research shows a complex pattern of human migrations. Kivisild et al. (1999) note that "a small fraction of the West Eurasian mtDNA lineages found in Indian populations can be ascribed to a relatively recent admixture." at ca. 9,300 ± 3,000 years before present, which coincides with "the arrival to India of cereals domesticated in the Fertile Crescent" and "lends credence to the suggested linguistic connection between the Elamite and Dravidic populations." Singh et al. (2016) investigated the distribution of J2a-M410 and J2b-M102 in South Asia, which "suggested a complex scenario that cannot be explained by a single wave of agricultural expansion from Near East to South Asia," but also note that "regardless of the complexity of dispersal, NW region appears to be the corridor for entry of these haplogroups into India." ^ a b c d e f g h Sharif, M; Thapar, B. K. (1999). "Food-producing Communities in Pakistan and Northern India". In Vadim Mikhaĭlovich Masson (ed.). History of civilizations of Central Asia. Motilal Banarsidass. pp. 128–137. ISBN 978-81-208-1407-3. Retrieved 7 September 2011. ^ Dikshit 2013, p. 132, 131. ^ a b c Gangal 2014. ^ a b c d Singh 2016. ^ Coppa, A. et al. 2006. "Early Neolithic tradition of dentistry: Flint tips were surprisingly effective for drilling tooth enamel in a prehistoric population." Nature. Volume 440. 6 April 2006. ^ "Metropolitan Museum of Art". www.metmuseum.org. ^ a b Maisels, Charles Keith. Early Civilizations of the Old World. Routledge. pp. 190–193. ^ Wood, Michael (2005). In Search Of The First Civilizations. BBC Books. p. 257. ISBN 978-0563522669. Retrieved 20 May 2016. ^ Meadow, Richard H. (1996). David R. Harris (ed.). The origins and spread of agriculture and pastoralism in Eurasia. Psychology Press. pp. 393–. ISBN 978-1-85728-538-3. Retrieved 10 September 2011. ^ Thoury, M.; et al. (2016). "High spatial dynamics-photoluminescence imaging reveals the metallurgy of the earliest lost-wax cast object". Nature Communications. 7: 13356. Bibcode:2016NatCo...713356T. doi:10.1038/ncomms13356. PMC 5116070. PMID 27843139. ^ Upinder Singh (2008). A History of Ancient and Early Medieval India: From the Stone Age to the 12th Century. pp. 130–. ISBN 9788131711200. Retrieved 10 September 2011. ^ Sarah M. Nelson (February 2007). Worlds of gender: the archaeology of women's lives around the globe. Rowman Altamira. pp. 77–. ISBN 978-0-7591-1084-7. Retrieved 10 September 2011. ^ Sharif, M; Thapar, B. K. (January 1999). "Food-producing Communities in Pakistan and Northern India". History of civilizations of Central Asia. pp. 254–256. ISBN 9788120814073. Retrieved 7 September 2011. ^ a b Upinder Singh (1 September 2008). A History of Ancient and Early Medieval India: From the Stone Age to the 12th Century. Pearson Education India. pp. 103–105. ISBN 978-81-317-1120-0. Retrieved 8 September 2011. ^ Dibyopama, Astha; et al. (2015). "Human Skeletal Remains from Ancient Burial Sites in India: With Special Reference to Harappan Civilization". Korean J Phys Anthropol. 28 (1): 1–9. doi:10.11637/kjpa.2015.28.1.1. Jarrige, J. F. (1979). "Excavations at Mehrgarh-Pakistan". In Johanna Engelberta Lohuizen-De Leeuw (ed.). South Asian archaeology 1975: papers from the third International Conference of the Association of South Asian Archaeologists in Western Europe, held in Paris. Brill. pp. 76–. ISBN 978-90-04-05996-2. Retrieved 19 August 2011. Kenoyer, Jonathan M.; Miller, Heather M. L. (1999). "Metal Technologies of the Indus Valley Tradition in Pakistan and Western India". In Vincent C. Pigott (ed.). The archaeometallurgy of the Asian old world. University of Pennsylvania Museum of Archaeology. pp. 123–. ISBN 978-0-924171-34-5. Retrieved 23 August 2011. Kenoyer, J. Mark (2005). Kimberly Heuston (ed.). The Ancient South Asian World. Oxford University Press. pp. 30–35. ISBN 978-0-19-517422-9. Retrieved 4 March 2015. Sinopoli, Carla M. (February 2007). "Gender and Archaeology in South and Southwest Asia". In Sarah M. Nelson (ed.). Worlds of gender: the archaeology of women's lives around the globe. Rowman Altamira. pp. 75–. ISBN 978-0-7591-1084-7. Retrieved 23 August 2011. Kenoyer, Jonathan Mark (2002). Peter N. Peregrine, Melvin Ember (ed.). Encyclopedia of Prehistory: South and Southwest Asia. Springer. pp. 153–. ISBN 978-0-306-46262-7. Retrieved 23 August 2011. Burton Stein (4 March 2015). "Ancient Days: The Pre-Formation of Indian Civilization". In David Arnold (ed.). A History of India. John Wiley and Sons. pp. 39–. ISBN 978-1-4051-9509-6. Jim G. Shaffer; Diane A Lichtenstein (1995). George Erdösy (ed.). 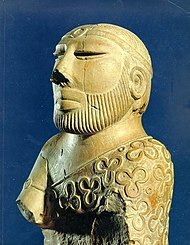 The Indo-Aryans of ancient South Asia: Language, material culture and ethnicity. Walter de Gruyter. pp. 130–. ISBN 978-3-11-014447-5. Retrieved 20 August 2011.